Recently I needed more strength and stamina to make through all I had to do in a day and a week. I was already tired, and I was going to be away from home more than I liked. I was tired of eating nuts and berries on the go, or a yogurt for quick protein. I wanted something even simpler and cleaner to eat. I found and tucked a small bag of whole Chia seeds into my purse – no refrigeration needed. I added these little seeds to everything all day, liquid or solid, and also took them dry by the spoonful at times when I desperately needed more energy fast to keep going. It worked! I had the strength and stamina to work from 7:30 am to 10:30 pm, with a smile and a clear head. Chia seeds not only give energy, but they are a mood enhancer due to their excellent Omega 3 fatty acid profile and high mineral content. In fact, I felt better than I had in quite a while! I was amazed that I could keep going, relaxed despite the emotional and physical stresses I was experiencing for several long days. Now I won’t go anywhere without taking my bag of Chia. Once a staple food of the ancient American traditional cultures, Chia seeds are becoming immensely popular once again due to their incredible nutritional profile and easy assimilation. Chia Seeds are power-packed with superior nutrition! 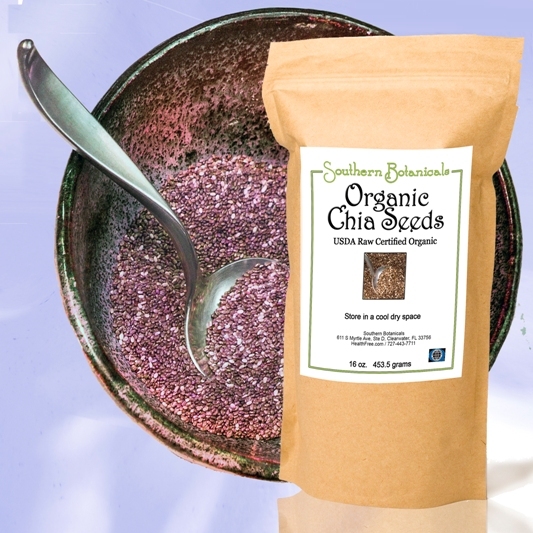 Chia seeds are richer in Omega 3 fatty acids than flax seed and are more stable than flax. In fact, whole Chia seeds can be stored unrefrigerated for two years without loss of its vital nutrients and oils! Our modern diet is generally deficient in Omega 3 fatty acids. Almost all of our foods have less Omega 3’s and more Omega 6’s than in the past when foods were raised better without chemicals and processed less. The ratio of Omega 6 to Omega 3 fatty acids is supposed to be 2:1 or 1:1. But today most people are eating a 20:1 ratio of these fats – a huge imbalance! Too much Omega 6 is inflammatory to the body and has been linked to higher rates of obesity, heart disease, arthritis, and other ills of modern society.To restore the Omega 6/ Omega 3 balance missing in our diet, Chia is a potent, safe, non-toxic plant alternative to fish oils. Chia is cholesterol free, needs no stabilizers to keep fresh, no toxic or anti-nutritional properties, and is very sustainable and environmentally friendly. A great way to eat chia is to first soak the seeds. They can very rapidly absorb a large amount of liquid, between 9-12 times their volume, in under 10 minutes. The best way to use the seeds is to take the seeds already hydrated so they will not absorb your own body fluids to hydrate. The seeds may be added to anything from water to juice and any food and will not change the taste. You can also take a spoonful of gel straight for nutrition. When soaked or put in any liquid food, the soluble fiber in the gel formed creates a wall between carbohydrates and the body, releasing them slowly into the body and giving a feeling of fullness. This, together with the dense nutrition, cuts cravings. Wonderful, versatile whole superfood! See other Super Nutrition foods….